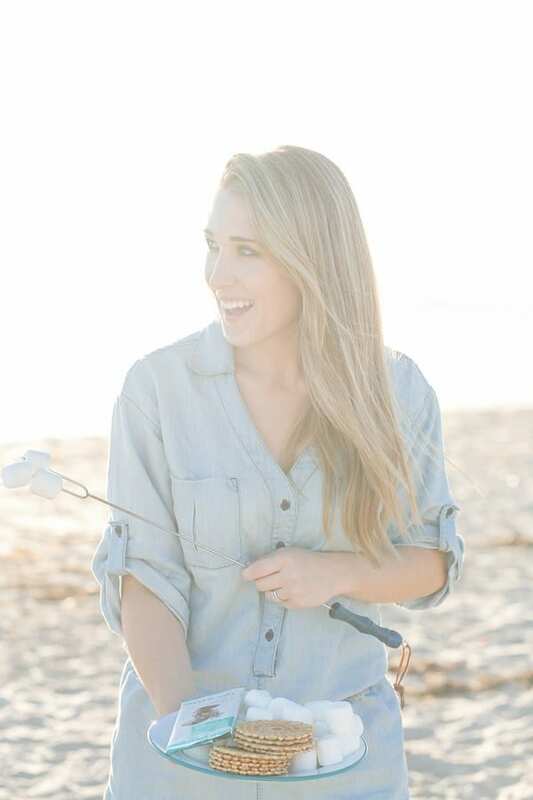 To celebrate one last time before the end of summer, last week I hosted a beach bonfire for Zan and two of our friends. Honestly, it was such a great experience we’re all wanting to do it again soon! I prepared a meal that we could cook over the fire and packed salads and the best marinated olives (recipe courtesy of my friend Maria!) in Weck jars. We ate and drank until it was completely dark outside and the only light was from our little fire and the shining stars. 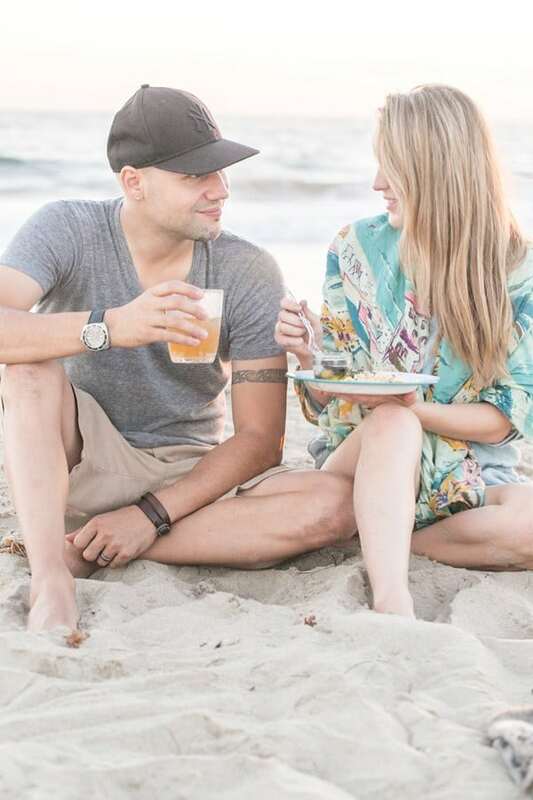 It was so relaxing to eat a fireside dinner on the sand and stare at the most beautiful, serene ocean. It was also very rewarding knowing we all helped to create a perfect bonfire area to hang out at all evening and that the campfire food and desserts turned out great! 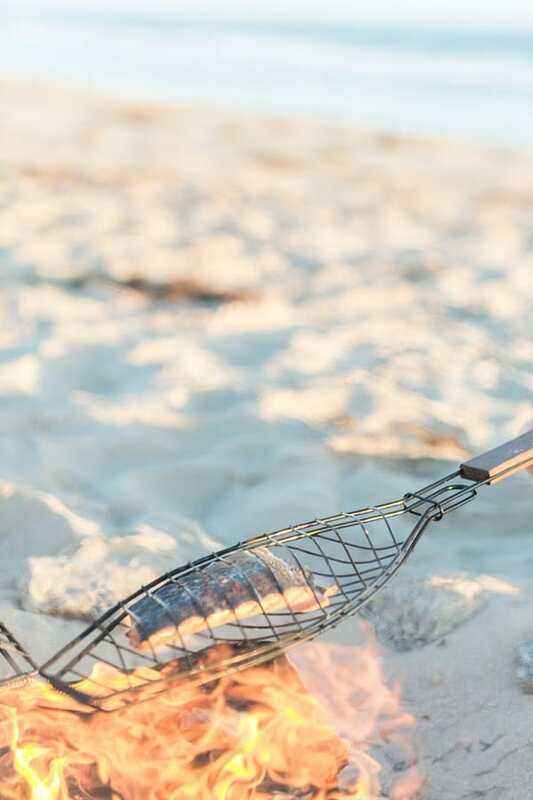 Below is my menu for the evening and tips for hosting your own beach bonfire. 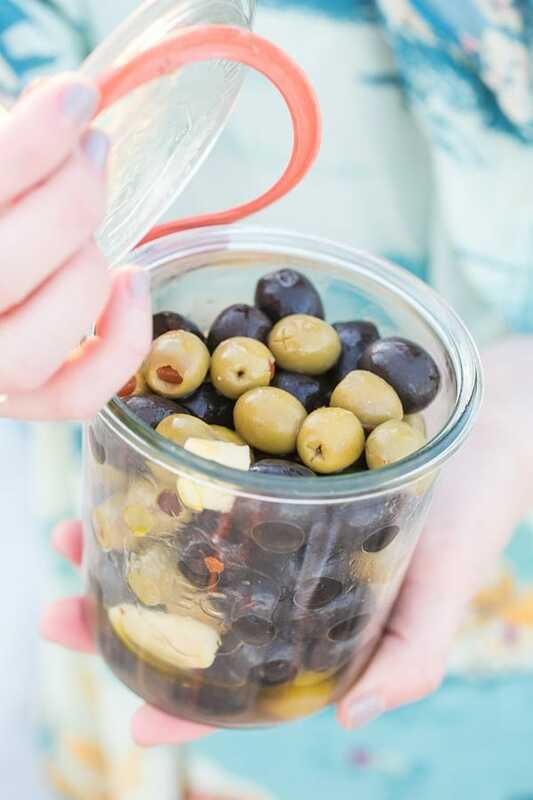 Marinated Olives – One jar pitted green olives, 2 cans black olives, juice of 1 1/2 lemons, 1/2 cup olive oil, 5 cloves garlic (sliced), red chili flakes and pepper. Mix it all together and let the olives marinate overnight. I promise you, they’ll be gone in one sitting. They’re so incredibly tasty!! Thank you Maria for the recipe! 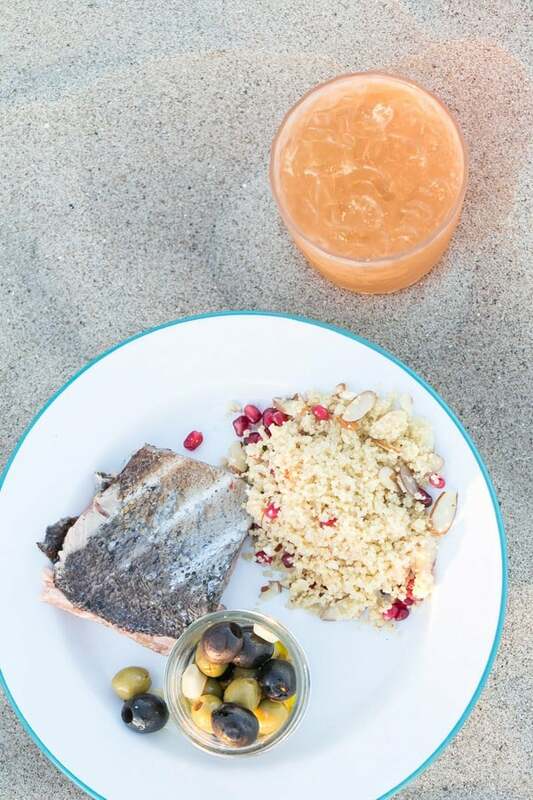 Campfire Salmon – To make this easy, purchase already cut, cleaned salmon from the market. Place it on a campfire fish basket, with a large chunk of butter, juice of one half lemon and salt and pepper. 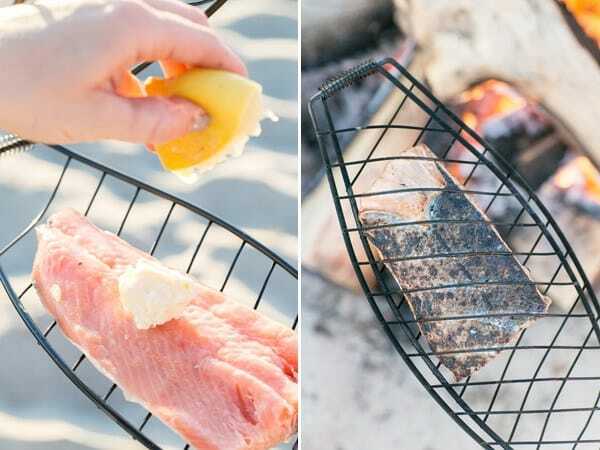 Close the basket and cook over the fire until it’s the perfect color of a flame-broiled salmon! Oh my it’s sooo tasty! 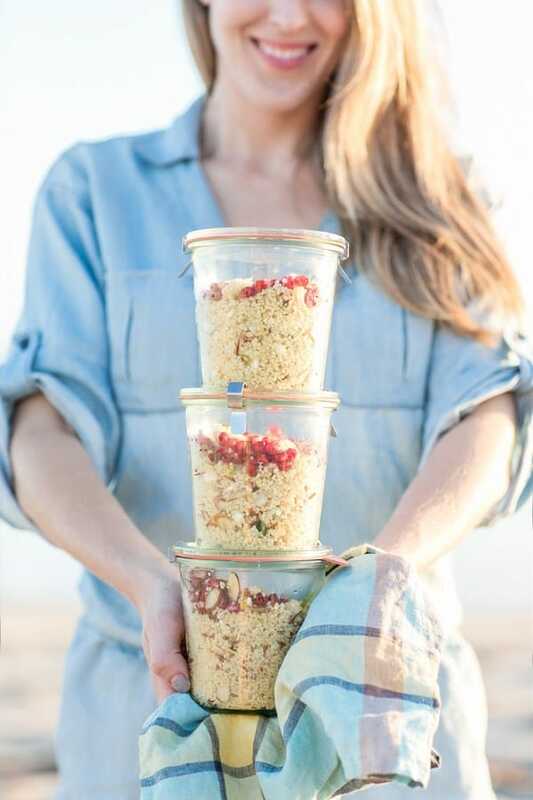 Couscous salad – I love couscous with salmon, so I whipped up a light couscous salad with slivered almonds, feta cheese, lemon juice, basil olive oil, salt and pepper and pomegranate seeds. 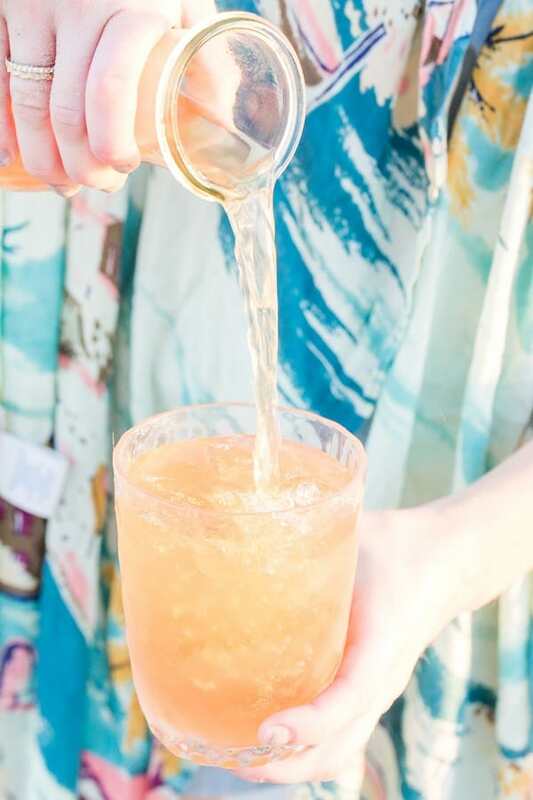 Peach Tea and Rum Cocktail – Recipe Here. I made a large batch of this cocktail and stored it in a tall Weck jar, on ice. 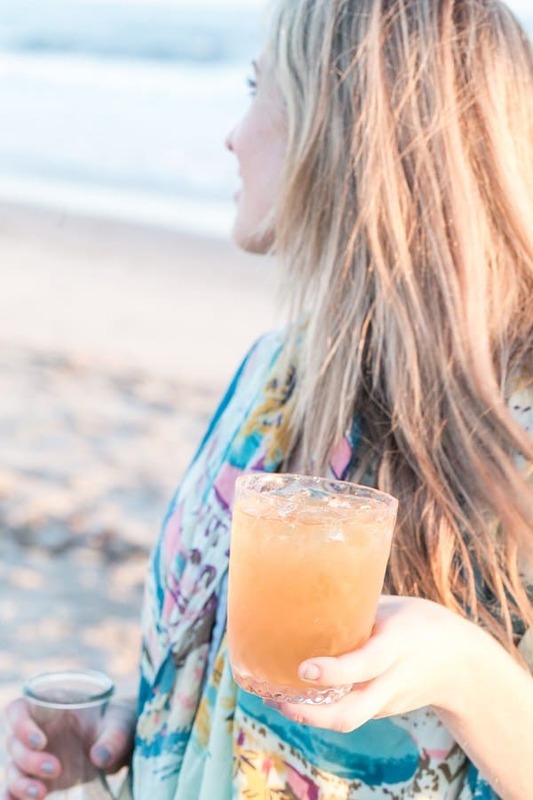 It’s definitely one of our favorite cocktails and it tastes even better sipping it on the beach! Campfire Apple Pies for Dessert – Recipe Here. 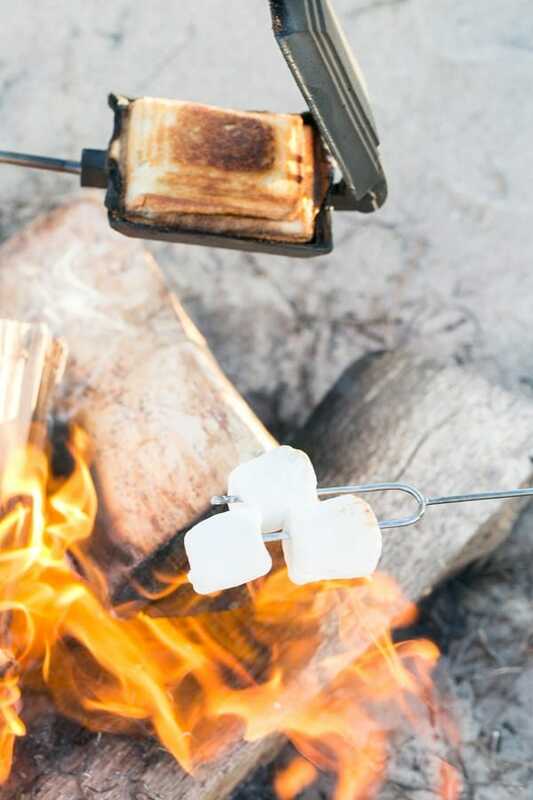 Campfire S’mores – I switched it up a little and used Pizzelles instead of graham crackers. 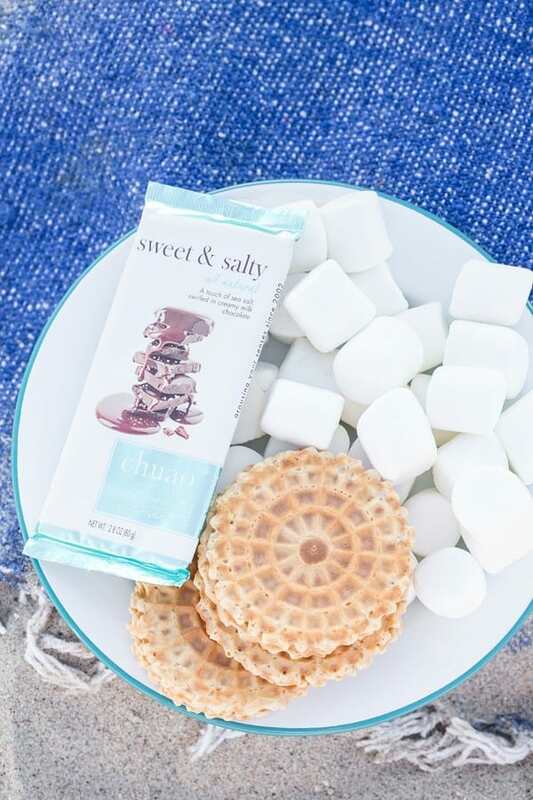 I also chose a sweet and salty chocolate bar, perfect for the beach! They were divine! 1. Dig a small, round hole where the fire will be. 2. Gather rocks and make a circle with them around the hole. 3. 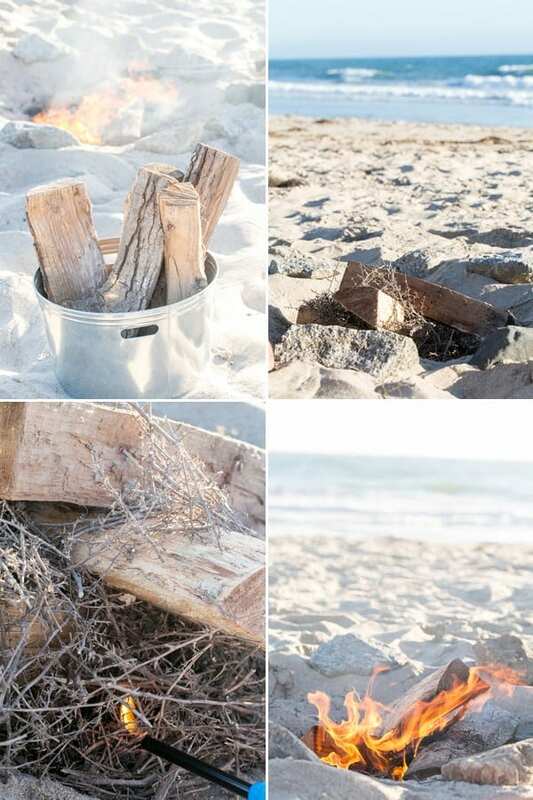 Add in three logs and a lot of kindling (dried small twigs or branches or newspaper). You can place two logs side by side with about 6 inches of space between them. Place the kindling in the gap between the logs and then put the 3rd log over the top of the logs on an angle. 4. 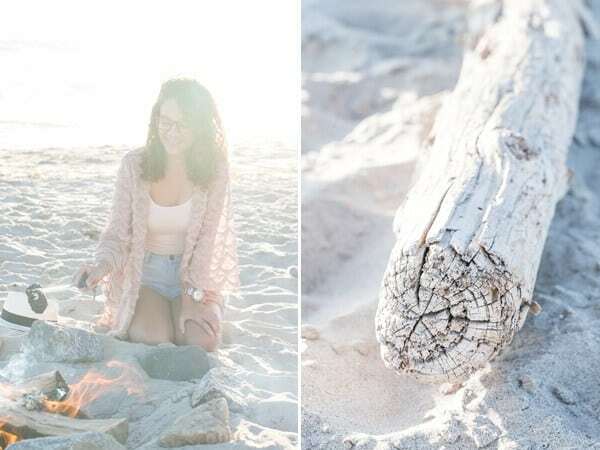 Use a long reach lighter to light the kindling under the wood. 5. Have a lot of patience as it takes a good 15 minutes for a fire to get going. Lightly continue to blow air on the kindling as it catches fire. Don’t give up, you can do it! Some Chinet disposable forks, plates, etc. Skewers and fish baskets for cooking over the fire. A large cooler (preferably with wheels) full of ice. Lots of wood, kindling and a long reach lighter. Cutting board and a sharp knife. Blankets and extra towels, even dish towels. A garbage bag to toss and clean up everything after. And of course all of the bonfire food you prepped at home. Try to pack light in just a few bags so you don’t have too much to carry.